The Galanthus reginae-olgae in our garden blooms merrily along, even after temperatures in the 'teens. I'm sorry to read that Hitch Lyman of Temple Nursery fame, who probably grows more different snowdrops than anybody in this country, and knows more about growing them, doesn't have success with this species outdoors in New England; apparently the foliage (which arises mostly after the flower) gets trashed under the snow by spring. I'm sure I'm more lucky (so far over four years) than skillful, but we'll enjoy it while we have it. 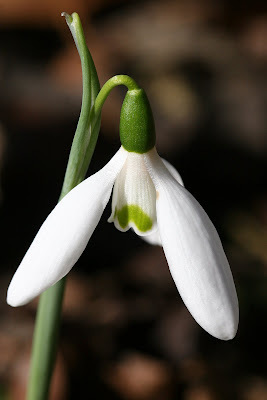 This picture shows the typical green inner petal blotch on this snowdrop; it looks a bit more like a "moon bridge" than like the upside-down heart seen on many snowies. Snowdrops are one of my favourite flowers, especially when they are planted in huge drifts. Zoe... I'm with you; need big drifts (I've GOT to break up some of my clumps next year. They are getting so packed, they are pushing bulbs out of the ground. The only nursery I can think of that probably carries Reginae-olgae is Bulbmeister (on-line). Their fall list seems to be blocked right now, so I can't check, but I think I recall it being listed before. They require a CITES permit for all their galanthus, so you have to make a fair purchase. The only other place I know of that has much of a selection of snowdrops is Temple Nursery; it happens I just got their new spring catalog in the mail today, and no R-O; as I mentioned in my post, the owner has said before he can't grow it in New York, where his nursery is. I only have the one bulb, which I only got by serendipity when it appeared amongst some bulbs of Galanthus elwesii.